When the frequency of an ac circuit is increased at constant coltage, the current increases and then decreases. Which combination of elements is most likely to comprise this circuit? When the frequency of an ac circuit is decreased, the current in the circuit increases.Which combination of elements is most likely to comprise the circuit? A battery is used to drive a circuit. After a certain amount of time the current is zero amperes. When the same circuit is driven by an ac generator,the current is non-zero and alternates. Which combination of elements is most likely to comprise the circuit? A 220 ohm resistor is connected an ac voltage source V=(150V*sin [2 PI (60 Hz) t]. What is the average power delivered to this circuit? 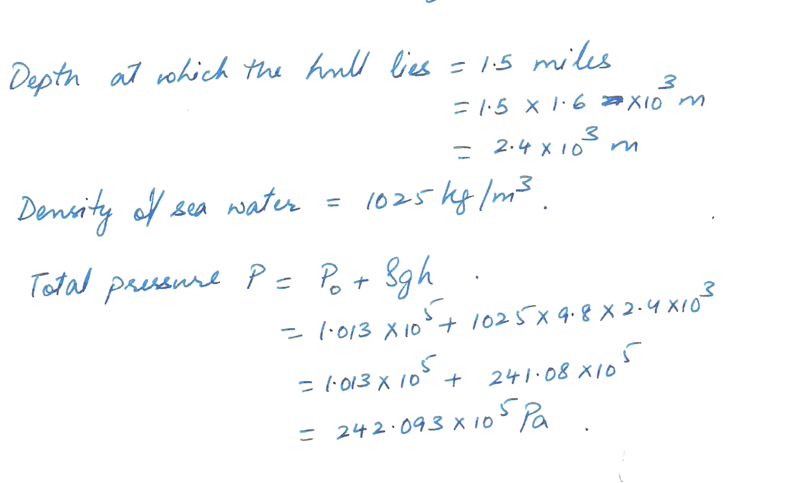 A ship lies at the bottom of the sea at 1.5 miles, what is the total pressure on the hull at that depth? A powerplant produces a certain amount of power at a certain voltage, the power is stepped up to a much higher voltage for transmission over long distances using a transformer then stepped down to a lower voltage before it enters your home. what is the purpose of this procedure? Draw wave form for average current if the voltage across a 5 micro F capacitor is as shown. The capacitor is initially charced to 3V with polarity shown. 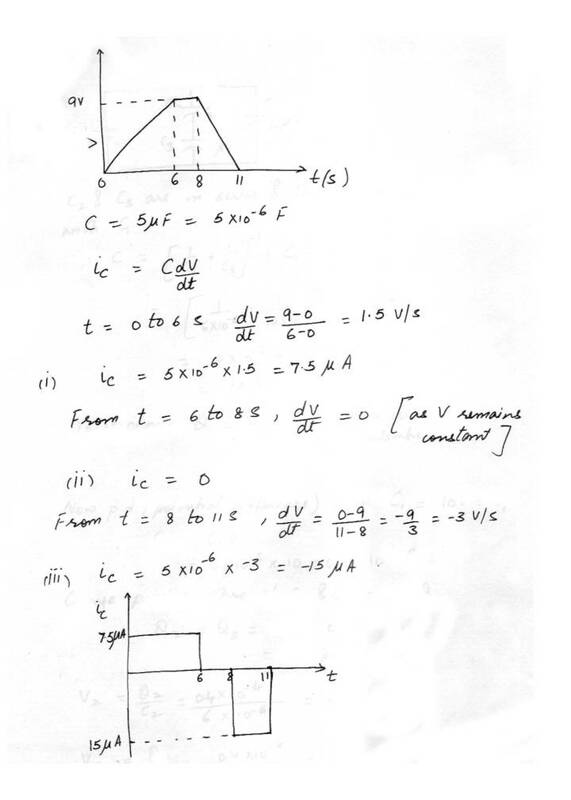 (a) Find the mathematical expressions for the voltage Vc and the current Ic when switch is closed. (b) Sketch the wave forms for Vc and Ic. 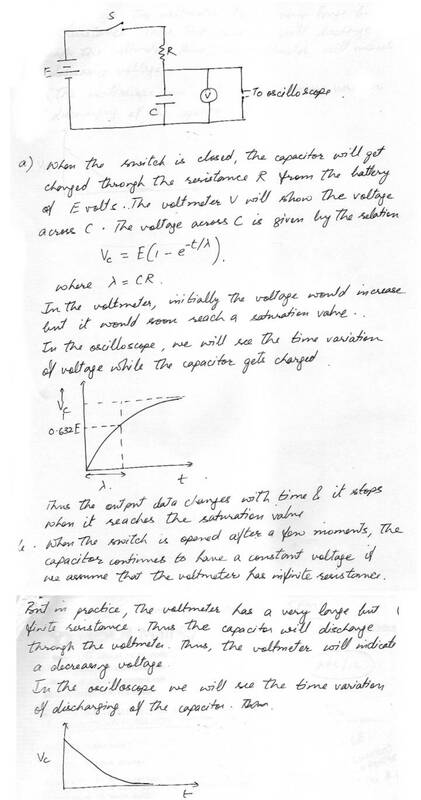 (b) Write mathematical equation for voltage Vc following the closing of switch. 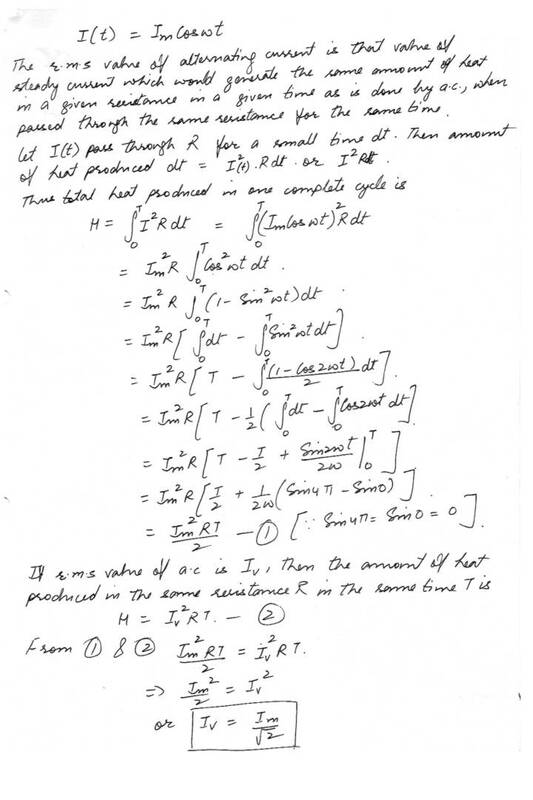 (c) Determine Vc after one three and five constant. Sketch the wave form for Vc and Ic. An ac generator produces 10 A of current at 400 V. The voltager is stepped up to 4500 V by an ideal transformer and transmitted a long distance through a power line of total resistance 30. 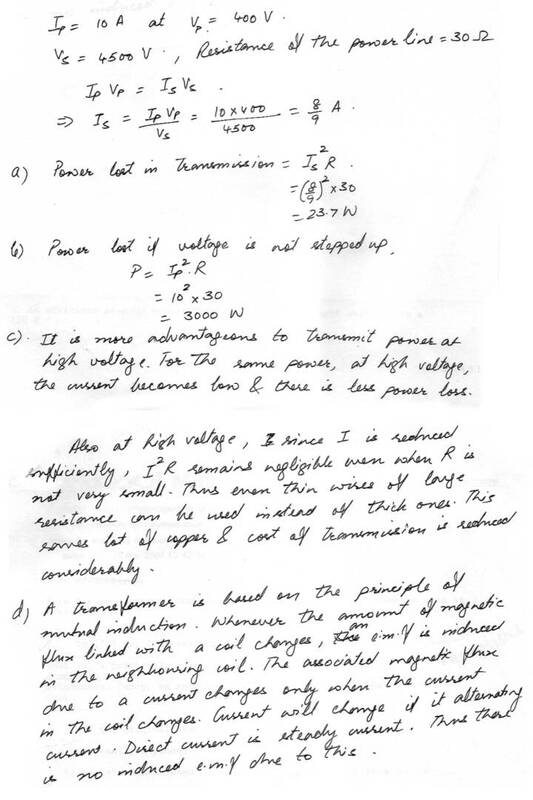 (a) How much power is lost in transformer? 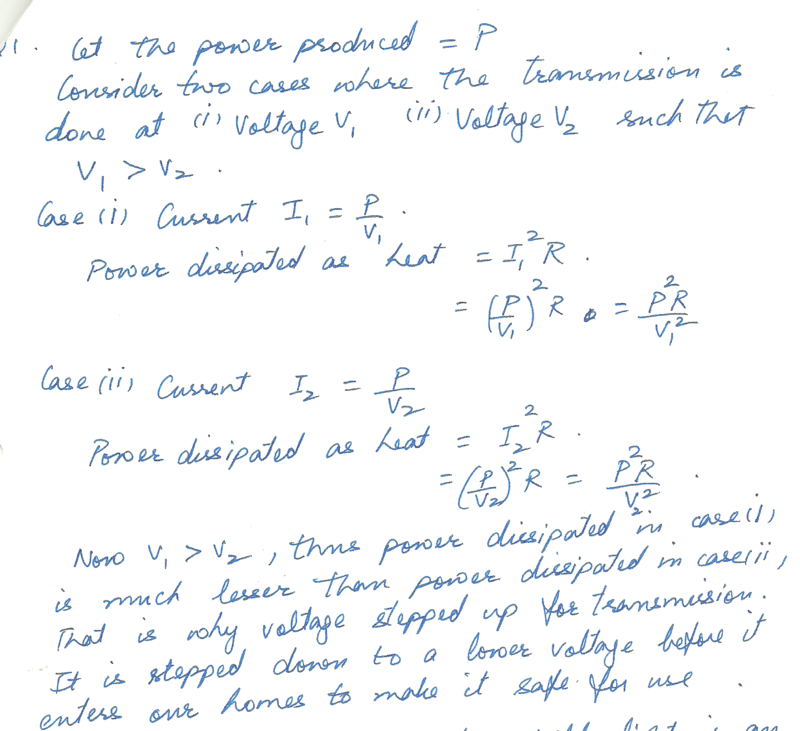 (b)If the voltage were not stepped up how much power would be lost in transmission? 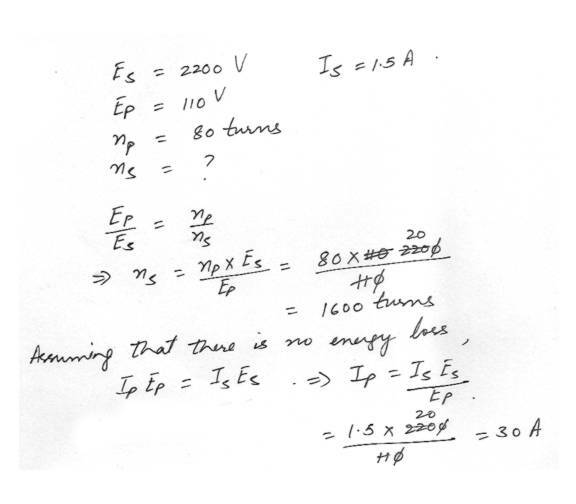 (c) From your answer above is it more advantageous to transmit power at high or low voltage? Explain why? (d) Why would a transformer not work if the current was direct instead of alternating? Explain fully. (b) Accelerate upwards at 75 cm/s^2 in a magnetic field of 1.0 T.
(c) Is your answer to (a) greater than less than or the same as your answer to (b) ? Explain why. (d) Suppose he wants to construct a 2.5 mT solenoid for other magnetic tricks. What length of wore would he need for a 10 cm diameter 20 cm long solenoid if he used a 100 mA current? Assume a constant diameter for each turn of the solenoid. When the switch is closed describe what the two measuring devices connected in parrallel will display for you. ( use diagrams if necessary) will the output data change over time? and if it does will it ever stop? (b) Open the switch after a few moments describe what the two measuring devices connected in parallel will be displaying use diagrams if necessary) will the output data change over time and if it does will it ever stop? A step - up transformer is designed to have an out put of 2200 V when the primary is connected across a 110-V source. If there are 80 turns in the primary how many turns are required on the secondary? If a load resistor across the secondary draws a current of 1.5 A, what is the current in the primary? A 20-micro F capacitor is discharged through a 5 -K Ohm resistor. The initial charge on the capacitor is 200 micro C. Sketch a graph of the current through the resistor as a function of time. Label both axes with numbers and units. What is the initial power dissipated in the resistor? What is the total energy dissipated? Use calculus to show directly that if i (t) = I (sub m ) cos wt it follows that I (effective or rms) = I (sum m) square root of 2.